Here’s another interesting magazine scan that I happened to find on Underground Gamer. 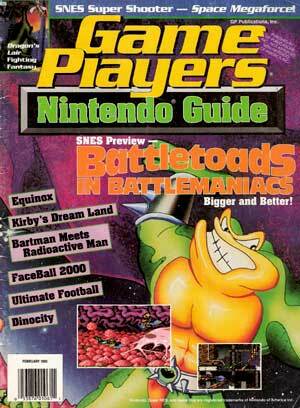 If you can remember back that far, you will recall that 1993 was a crazy time in the gaming industry. The Super Nintendo was finally starting to gain steam while Nintendo was still supporting the NES. Sega had the Sega CD coming out and there was a grand future that was unknown at the time. Kirby Saves the Day (28) “In Kirby’s Dream Land for Game Boy, our rotund hero’s appetite won’t be sated until King Dedede coughs up every one of those sparkling starts. Sexcellent, thanks for the download. I subscribed to this mag for years and really dug it. Sadly, all of my issues found their way into the trash after I left home for higher learning. Obviously I’m going to wind up doing the same thing to my kids when they move out of the house and they’re going to pass on the tradition to their kids. Gotta love traditions. Copyright? The magazine was canceled in 1998. I doubt the publisher cares anymore. Doesn’t matter, it’s still not allowed. Any chance of a reupload?